Israeli press reports have confirmed that the planned production at the Edinburgh Fringe by Ben-Gurion University dance group Pola has been cancelled. This follows the cancellation of the hip hop opera by Israeli state funded Incubator Theatre at the Underbelly last week after protests led by the Scottish Palestine Solidarity Campaign. Israeli media also claim that the search for an alternative venue in Edinburgh is being supported by Scottish Government despite the massive outpouring of public anger over the murder of more than 1,700 Palestinians by Israel. YNET News quote Rafi Gimzu, vice president and head of the Foreign Ministry’s Cultural Affairs Division and Science (DCSA) who claims the Israeli embassy “is in close contact with the management of the Edinburgh Festival, the Ministry of Culture of Scotland and the local police”. Recent reports, which have not been denied, claim that the Scottish Government plans to boycott planned events of the UK-Russia Year of Culture. A spokesperson for SPSC said “The Scottish Government has to come clean over its position on boycott. It cannot withdraw support for one cultural event and then work against the rising popular opposition to the massacre of innocent Palestinians. A spokesperson for the Association of Palestinian Communities in Scotland said “As refugees from Palestine we live in constant fear of receiving a telephone or text message telling us that another family member or friend has been killed. 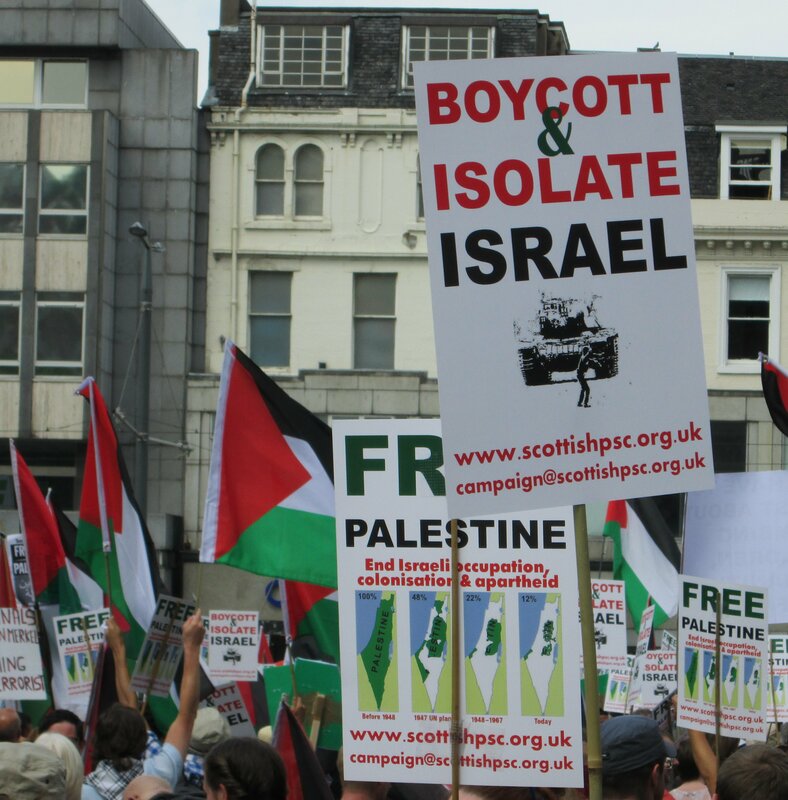 “The support and friendship we receive from the people of Scotland is being betrayed by the Scottish government’s refusal to support our call for the comprehensive boycott, divestment and sanctions (BDS) against the Israeli state until its crimes against the Palestinian people end. This call includes Israeli stated funded theatre. This entry was posted in Action, BDS, Boycott Israel, Edinburgh, Press Release and tagged Boycott, Edinburgh, Palestine, SPSC. Bookmark the permalink.